Listening to our intuition, to our body’s sensations, and body talk. Redirecting our thinking patterns from negative to positive. Shaping our surroundings to lift us up. Improving personal and leadership skills to increase our charisma. 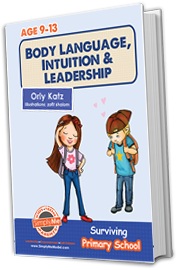 Use a rich toolbox: games, stories, riddles, questionnaires, activities, exercises, studies, and innovative theories, to strengthen intuition, body talk, and charisma, both personally and professionally, with the students and children, in the classroom and individually. Direct thinking patterns from pessimism to optimism for empowerment and the application of significant experiential learning for the students, to improve belonging, motivation, social skills, and the strengths of each student. Understand the nature, purpose, and benefits of identifying and practicing the ability to set boundaries and stand up for ourselves, both in and out of the classroom. Recognize how dealing with failure directly builds social and emotional skills when practiced regularly. Know how to design and implement an Action Plan to help students raise their motivation and self-awareness. Empower the teacher as a person, as a professional, and as a parent, and then apply and adapt the material for the younger generation, to empower the students and children through games, exercises, activities, stories, and innovative theory. I believe this course should be compulsory for all trainee teachers and facilitators, but not just them, also for experienced teachers and facilitators within the system. A wonderful, clear and comprehensible, interesting, stimulating, instructive, and blessed course! Thank you very much! The course was constructed in an interesting, enjoyable, experiential, and enriching way. I’m enchanted by the course! The idea of videos is wonderful, not to mention how interesting it is… I wrote down all the exercises, games, and activities. I’m already applying them with myself and with my kids and students! Orly, I’ve finished studying and I’m excited again... Wow, What exceptional work!! !